Orthodoxy, Autocracy, Nationality, the triad of Tsar Nicholas I (lead image, left), is no longer as dead as tsardom. It has been revived by Patriarch Kirill (right), leader of the Russian Orthodox Church; backed by the Kremlin; and is now unopposed by the Communist Party of the Russian Federation and its leader, Gennady Zyuganov (centre). In 1833 Nicholas, seated nervously on his throne for eight years, had the idea that he might ward off palace putsches – they had killed his father Paul I, grandfather Peter III and threatened himself in the Decembrist uprising – with an ideology to which his rivals for power could be recruited for their allegiance. Called the triad, it was in practice the tsar’s bargain for mutual protection from murder and civil war with the Church (Правосла́вие, pravoslavie) and the court of noblemen (самодержа́вие, samoderzhavie) and their alliance to deal with everybody else. Narodnost, “nationality”, the third leg of the triad, wasn’t the narod, “the people”; there was nothing democratic about it. As the Russian triad, it was meant to oppose, suppress and destroy domestic agitation for the French triad – liberty, equality, fraternity. For a brief synopsis of the history, read this. At the Kremlin last Thursday, January 31, Patriarch Kirill, leader of the Russian Orthodox Church, spelled out his revival of the triad, with an explicit endorsement by President Vladimir Putin. For Kirill, the triad now assigns Orthodoxy equal power with the Russian state. Read what he and Putin said by clicking here. Source: http://tass.com/ Kirill was repeating the Roman papal pitch, Duo Sunt (“There are Two”) of the year 494. That was the doctrine that church and state (monarch) shared power, God on the side of the Church and the military for the monarch. For details, click. So far there has been no public debate in the Russian media of the impact of the Kirill-Putin pact on the ten articles of the Russian Constitution which protect Russian democracy from the forces of religion or anti-religion. For the full text of the constitution, as revised through 2014, click to open. The articles protecting the rights of Russian citizens from usurpation by church or state are 3(4), 4(2), 8(2), 13(2), 13(4), 14, 19(2), 28, 29(2), and 44(1). Check the translation into English of the Russian here. The parliamentary committees responsible for constitutional legislation in the State Duma and Federation Council and leading constitutional lawyers were asked to say whether Kirill’s claims violated these articles of the constitution. They acknowledged receiving the questions by telephone and email; they all refused to answer. 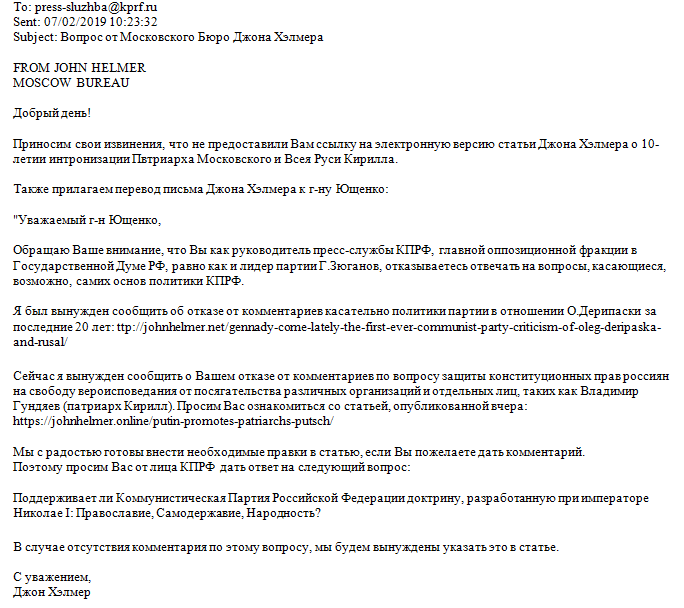 So did the spokesmen for United Russia, the ruling party in the Duma, and the three main opposition parties. With 43 seats to United Russia’s 340, the Communist Party of the Russian Federation (KPRF) is the leading opposition group in the Duma. Alexander Yushchenko has been the party spokesman for twenty years and is a member of the party’s Central Committee. 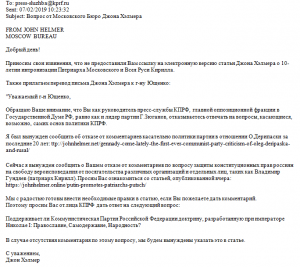 After he had not replied to last week’s round of questioning on the Kirill-Putin pact, Yushchenko was asked again to clarify the Communist Party’s response. The Communist Party refuses to answer.